is a fate crueler than death. while in the cold confines of my cell. imagine there’s mouths to be fed. but I am broke as hell. and I am barely getting by. thoughts of escaping, constantly plagues my mind. every corner I turn I am surrounded by poverty and his gang. my plan is to execute the greatest escape. but I am definitely working at it for tomorrow. 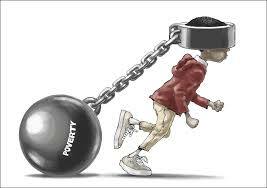 for Poverty’s prison I need to get away from. Things always do get better – rarely do we stay trapped in poetry for a life time. Good poem, nice imagery.